On a hillside facing the sea, this luxury resort offers large guest rooms featuring ocean-view balconies and marble baths. For ultimate relaxation, surrounding the pool and beach areas you'll find 100 hammocks and padded teak furniture. Smoke free premises. 526 units, some two bedrooms, three bedrooms and kitchens. 1-6 stories, exterior corridors. Oceanfront. On Mex 1, 6 mi (10 km) e of town. 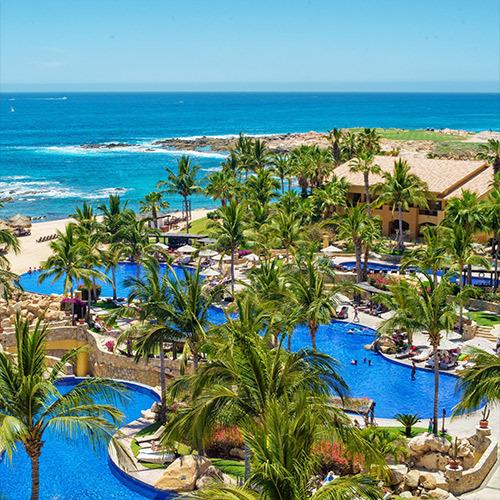 Located at Cabo del Sol. Carr Transpeninsular KM 10.3, Lote A-1 23410 (Carr Transpeninsular KM 10.3, Lote A-1). 7 restaurants, also, Rosato, see separate listing, full bar, nightclub, entertainment. sauna, hot tub, steamroom, snorkeling, regulation golf, recreation programs, kids club, health club, spa. valet laundry, rental car service, airport transportation, room service, child care, area transportation-downtown Cabo San Lucas & San Jose.